You've had a few days to digest your Thanksgiving feast, but might still have some pie leftovers lingering in the fridge. And what better time to start carb-o-loading for the holiday season ahead than now. My suggestion? Get double duty out of your leftovers while also building up some endurance for the epic eating season ahead by preparing cinnamon rolls stuffed with Thanksgiving pie leftovers. Dice up the pie filling and stuff it in your cinnamon rolls before baking; reserve the crust and cut or crumble it on top for a satisfying crunch. A most delicious post-Thanksgiving breakfast indeed. Note: I used jumbo pop-and-bake style cinnamon rolls (don't judge me), but you could use the homemade version of your choice. 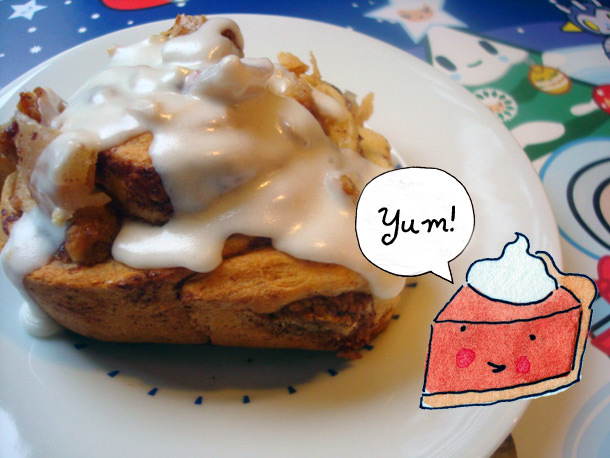 As for the pie, I filled my cinnamon rolls with leftover apple-cranberry pie; just about any baked pie would work, but I would not suggest using no-bake pies. For the full entry, as well as how to concoct these carb-monsters, visit Serious Eats! And if you love stuffing your cinnamon rolls, you might also enjoy this chocolate chip cookie dough-stuffed variety.